NEW YORK, Dec. 3, 2018 /PRNewswire/ -- This afternoon, former pro and college football star Michael Griffin will help students at Cook Elementary School learn about the importance good oral hygiene at a fun and interactive event. 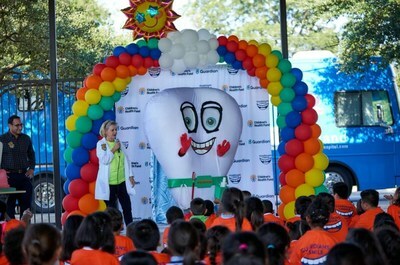 K-2 students at the Austin school will brush larger-than-life teeth, wrangle giant floss, and meet the Tooth Guardian™, among several activities designed to get them thinking about good oral hygiene at an early age. Earlier this year, The Guardian Life Insurance Company of America® (Guardian) committed $1 million to Children's Health Fund, launching the Guardians of the Smile partnership to provide quality dental care and education to children in underserved communities across the United States. "Austin is my hometown and where I started my football career, and today it's where I co-own a business. This community is everything to me," said Guardians of the Smile spokesperson Michael Griffin. "The children in this city deserve to have bright and healthy smiles. Guardian and Children's Health Fund are teaching kids about healthy habits, moderation, and self-esteem, lessons which will last for years." From January to June 2018, Children's Health Fund's programs provided more than 7,500 dental encounters to children in Washington D.C., Dallas, Idaho, Los Angeles, New York, and Southern Arizona thanks to Guardian's support. That number will continue to grow during the second half of the year as Children's Health Fund continues to reach more children in more communities. 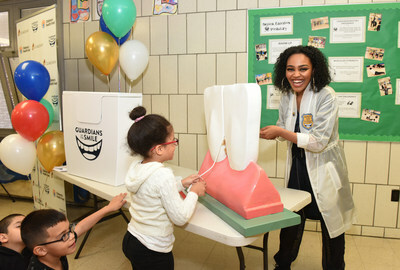 "As one of the leading dental insurance providers in the U.S., Guardian believes that all children, regardless of geography or income, should have access to dental services that foster good oral health," said Marc Costantini, Executive Vice President, Commercial & Government Markets from Guardian Life Insurance. "Our partnership with Children's Health Fund showcases the best of Guardian, and perhaps the best that companies can do when they put their values first." "Our approach to children's health is holistic, and dental care at an early age is essential to overall health," said Dennis Walto, Chief Executive Officer of Children's Health Fund. "Our efforts to ensure the whole child is healthy are strengthened by our partnership with Guardian. With their support, we are providing engaging and fun programming that teaches children the importance of dental health and builds good oral hygiene practices that will benefit them all through life." Guardians of the Smile events will continue in 2019, with events planned for Arizona, California, and Washington, D.C. Founded in 1987 by Dr. Irwin Redlener, singer/song-writer Paul Simon and program designer Karen Redlener, Children's Health Fund's mission is to ensure access to high quality, comprehensive healthcare to homeless and low-income children and their families. Children's Health Fund (CHF) accomplishes this mission by bringing patient centered medical home care to disadvantaged children through our national network of partners; reducing "health barriers to learning" that interfere with child development and school performance; responding to the needs of vulnerable children impacted by major public health crises; and improving the health and well-being of children through advocacy and public education efforts. Over the past 31 years, CHF has provided more than 4.1 million health care encounters, often in places where doctors and health care providers are in short supply.